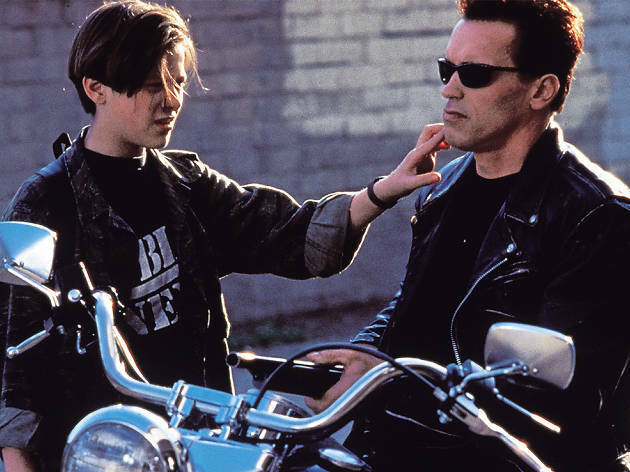 Having failed, in Cameron's impressive original, to prevent the birth of future resistance leader John Connor, the machines running the world in 2029 again send a cyborg to our era to kill him off as an unruly LA teenager (Furlong). Again, too, the resistance responds by sending the boy a protector: a T800 cyborg (Schwarzenegger) physically identical to the one which formerly laid siege to John's mom Sarah (Hamilton). That Arnie is now a good guy is one twist; the other is that he's the underdog, since the T1000 (Patrick) despatched by the machines is far more sophisticated, constructed from liquid steel so that it can adopt the appearance of anyone or anything it chooses. The film is much the same as its predecessor, except that the effects are more spectacular, there's a lumbering anti-nuke subtext, and the script's good-natured wit is undercut by the sentimentality of Arnie's becoming a caring cyborg. Structured as a simple chase, the story sags midway, but the first hour and last 30 minutes display an enjoyably relentless bravura.